M.J. Rose is the international bestselling author of fourteen novels and two nonfiction books. She is a founding board member of International Thriller Writers and founded the first marketing company for authors: AuthorBuzz.com. Rose lives in Connecticut with composer Doug Scofield, and their very spoiled dog, Winka. To learn more about M.J. Rose and her work, visit her website at: www.mjrose.com. When I read the synopsis and saw the name Catherine De Medici, I was thoroughly intrigued by that alone. The only thing I really knew of her was she liked to poison people, and who wouldn't be thrilled by the mystery in that. This story is quite the play on that only piece of knowledge I had. But much more detailed and in depth. In true M.J. Rose style, this book is filled with links to history, mystery and suspense. I enjoy reading her books a lot. In fact, her books are the only ones that I have read where I appreciate the flipping back and forth between time periods. Generally that would drive me nuts, but she always makes it work. She has a talent at connecting the different time eras. The only thing that still sticks out in my mind was wondering if they really would have had votive candles in the 1500's? I know tapers were around, but votive? I feel I need to know this. For full terms & conditions see the bottom of the form. Catherine De Medici is such an interesting historical figure and I am totally interested in her and her poisons. Not for personal use of course! 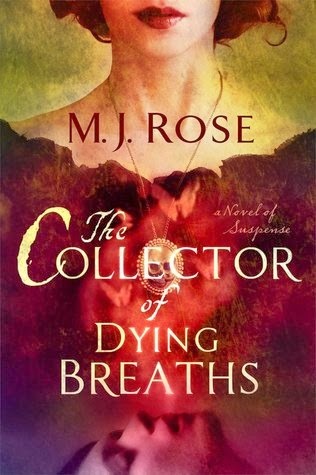 I've never read anything by M.J Rose but I have seen her books and been intrigued. I love historical books with elements of mystery or suspense so this is right up my alley. Hmm... not sure on the candles - I'd say possibly? I didn't enjoy this book as much as you did, but I did love learning about Catherine. A lot of authors are using that same technique of jumping backward and forward in time. It's good to hear that Ms. Rose does it so well. Thanks. Perfumer turned lethal weaponist, what a combo. To learn about such an important historical figure through this story makes it more fun! Perfumer turned lethal weapon poisoner is intriguing and add on the historical aspect of such an important figure...must read! I've only heard tidbits about the Medici's, but they seem to be a great historical characters to add to a novel like thise. I so cannot wait to read this book!! Thanks for the chance to win. I agree the title alone is intriguing and I enjoy historical fiction and mythology. I forgot to say that I hope you link up this and 2 other posts with my #SmallVictoriesSunday #linky open now and all week long.